40+ Style » What to buy » The best bathing suit cover ups – from beach cover up to maxi kaftan! When you are going on a beach holiday, you want to make sure you have a good bathing suit or bikini. Check our article on the best bathings suits for women over 40 for that. However, just as important is to find the best bathing suit cover ups. I’ve gone online and selected some of the best ones for you. What to look for to find the best bathing suit cover ups? Ideally it fits with your bathing suit; why should coordinating your clothes stop at the beach? It needs to be stylish; you want to feel good about yourself, especially on the beach where you may be more conscious of your body. A great bathing suit cover up will give you confidence! No matter which beach destination you choose, there will be plenty of sun and beautiful beaches so coverups (and lots of sunscreen) are essential. 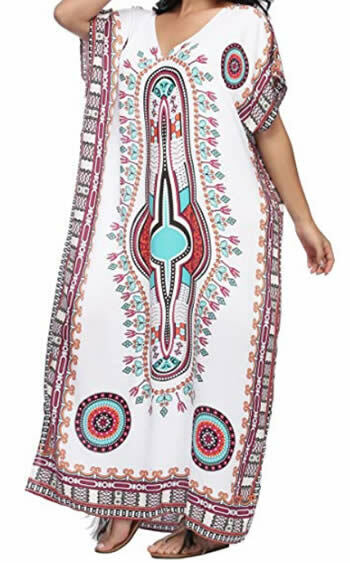 Here are some of the best tunics and caftans for the beach currently available online. 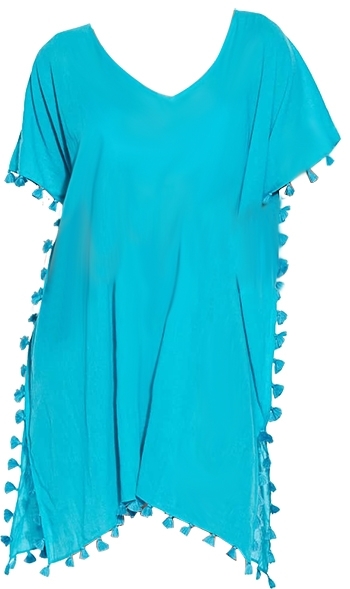 A short swimsuit cover up that covers the most important areas is fabulous for strolling on the beach. This one is super stylish and comes in black and white. This beach and swimsuit cover up is simple and easy to put on. It comes in all kinds of colors. This provides the best coverup and you can potentially feel like and look like a goddess in one of these. It feels exotic and glamorous to wear one. 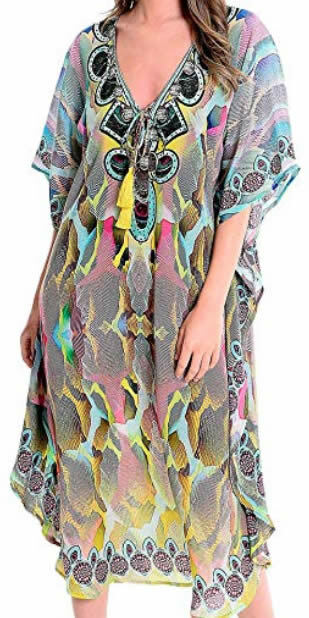 This feels more like a dress and is a good option for those that feel too overwhelmed in maxi kaftan but like more coverup than what you get from a short one. 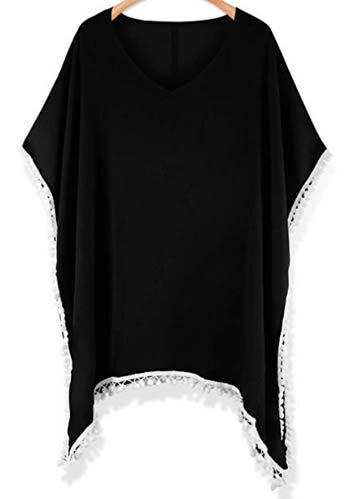 This very affordable option available on Amazon comes in many different patterns and colors but I’m loving the one below. I really love the shorter kaftan. These are great to slip over my beachwear but can also be easily mixed with lose fitting linen pants, capris or leggings. If you want to be a bit more chicer, you may like to opt for a maxi cover up dress. This one doesn’t cover your shoulders but will be refreshing and super stylish when you go for dinner on the beach in the evening. These are great to throw on on the beach whenever you go for a walk, or need to get that much needed ice cream. If you have a version that’s not too see-through you can also wear them for the evening if you belt them over knee high pants and wear a light top underneath. You will look very chic! You can find more options for wearing kimonos on my article on how to wear a kimono. Prefer to cover up your lower body too? 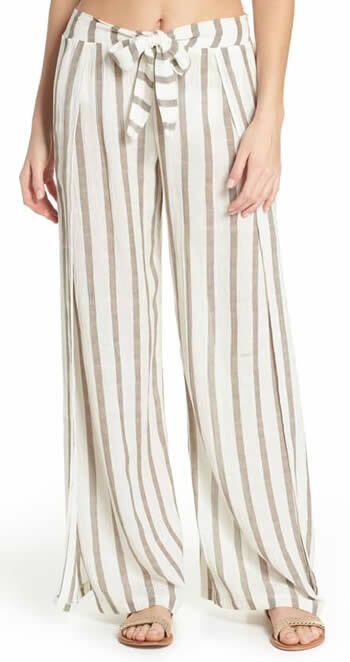 Then these fun cover up pants are for you. They are easy to combine with some of your tunics and kaftans too! If you want your cover up a bit chicer, you can also opt for a beach dress. The one below would look for day and evening. I always take some light pants whenever I go on a summer holiday. You can’t beat white pants as almost every tunic and caftan will look great over that. I love to take both a wide linen version and a cropped knee-high pants. Leggings are perfect too. So comfortable and easy to wear on holiday. Finally, I will be taking my shorts, which I love wearing on holidays. They make for a great relaxed look while combining them with kaftans and kimonos or even an asymmetric blouse (which is what I will be wearing!). I hope you have been able to find the best bathing suit cover ups for your needs. If you need something to wear underneath, be sure to check out the best bathing suits and swimwear. I wish you an amazing holiday! Have you find the best bathing suit cover ups yet for your style? 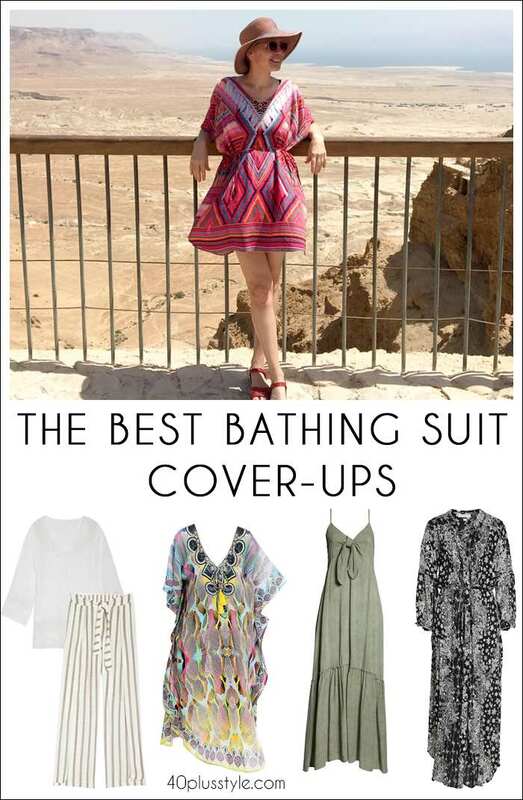 Like this article on the best bathing suit cover ups? Share it on Pinterest!